The SlingShot 200 AW is designed to hold up to a pro-size SLR with a medium zoom lens attached and about 2-4 extra lenses, as well as some other accessories. The main compartment loads from the side so you can swing the bag from your back to your chest and access your equipment. Like most camera bags today, the divider pads are moveable in order to allow you to customize the bag to your equipment needs. With some minor adjustments to the padding, I have no problem fitting my Nikon D200 with the battery grip attached and about 3-4 lenses or a flash. Rounding out the main compartment are a memory card flap and a built-in microfiber cloth that can be folded over your camera. I’d recommend putting the two lenses you plan to access the most toward the top of the bag. By doing this, all you have to do is lift up one of the padding flaps to access your gear. Because of the depth of the bag, you can easily stack two small prime lenses and fit them in a single lens compartment. The SlingShot 200 AW features two main accessory compartments. The first compartment on the front of the bag is great for holding extra batteries, cleaning supplies, or other small accessories. The second compartment sits at the top of the bag and has a decent amount of room. It’s great for holding non-camera related items, but I generally use it for an external flash and all of its accessories. The bag features a single padded carrying strap that hangs over your right shoulder. There is also a second small strap that clips into the main strap to prevent the bag from sliding around. I would say it distributes the weight much better than a shoulder bag, but not quite as well as a backpack. Even though the SlingShot 200 is comfortable, a fully loaded bag on a full day of shooting may leave you a little sore, but not as bad as a shoulder bag. 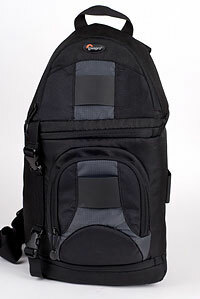 If the main compartments don’t quite hold what you need, the bag is fully compatible with the Lowepro SlipLock pouches. There is a holster on the main strap, two on the front part of the bag, and one on the right side. The front SlipLock slot is great for a memory card wallet or a small point-and-shoot case, while the others are perfect for any larger lenses that may not fit into the main compartment (ie: a 70-200mm f/2.8). The only thing I wish they would have included is a spot for a tripod. I have seen several people modify the bags to accommodate one, but it should have been on the bag. The Lowepro SlingShot 200 AW is the perfect bag for someone who wants to go out shooting with a medium amount of gear. It is by no means a backpack replacement in terms of capacity, but its quick access makes it extremely useful in a lot of situations. I frequently use it in situations where I don’t need everything but want to be able to get at my equipment quickly. If you plan to carry a large zoom lens such as a 70-200mm f/2.8 or 300mm f/4 I would probably recommend looking into the SlingShot 300 AW, which has a little more depth to accommodate such large lenses. If you have a smaller body and maybe 1 or 2 lenses and want a smaller bag, the SlingShot 100 AW might be the best option for you. Overall, I would definitely recommend giving the SlingShot 200 AW a try. Easy access to your equipment without the stress of a shoulder bag. 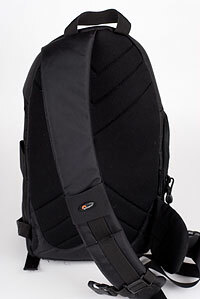 Plenty of expansion slots for Lowepro SlipLock accessory pouches. Comfortable shoulder strap with great padding. All-Weather Cover for extreme situations. No access for larger lenses in the bag without adding pouches (or moving to the 300 AW). Sling style design might be a little awkward for some. If you’re interested, Lowepro has a video demonstration here.